As self-proclaimed forerunners of the “UK Rock Revolution”, Falling Red have taken their high octane brand of rock & metal from the UK Club scene to the legendary Hammersmith Apollo – all in less than three years of releasing their critically acclaimed debut album, ‘Shake The Faith’. Arena rock was their calling, so when the four original members found each other in 2007, their stall was set out from the start. Their aim; to rise through the ranks with pure ‘nose-to-the-grind’ hard work and prove that the only way to do it right, is to pay your dues on the road. Falling Red paid their dues… and then some! The touring was endless but the gigs increased in both venue size and numbers coming to check out the most talked about British band in years. “Meet the British Rockers conquering the planet one town at a time” Classic Rock Magazine – High Hopes (full page article). Stimulating performances soon had the press testifying “One of the finest live bands I’ve seen this year.” Rob Evans – Power Play Magazine. Support slots for UK shows were successfully secured with Sebastian Bach ( Skid Row ). Falling Red upped their game both on and off stage and left the crowd begging for more. Distinguished performances at both Hard Rock Hell & Hammerfest left no one in doubt that Falling Red are nothing short of exceptional, their high energy performances inciting mesmerised chants – one song after the other. In the summer of 2012 this was warranted when the band were hand-picked and confirmed as main support to Steel Panther. The nine date UK tour included many legendary venues such as Hammersmith Apollo, Manchester Apollo, Wolverhampton Civic Hall and Edinburgh Corn Exchange. 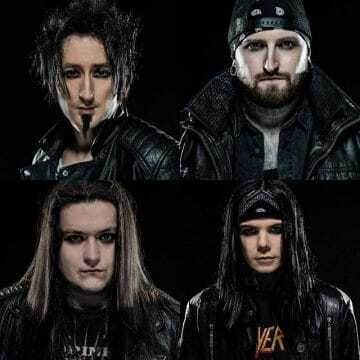 Falling Red took to the stage each night with ferocious swagger and left with the mass applause of thousands of new fans; four of which were the members of Steel Panther, who watched nightly, applauding the band from side stage. Falling Red did what they do best and hit the road again in March 2013 with a Headline tour which rammed out 02 Academy2 venues. It had been decided in the winter months that the band was now ready to follow up their debut album ‘Shake The Faith’ (2010) (and 2011′s follow up E.P ‘Hasta La Victoria Siempre’) and chose to utilise the PledgeMusic platform. The pledge campaign for sophomore album ‘Empire of the Damned’ was launched on 4th March 2013 and reached the 100% target mark within 5 days of launching. The campaign ended on 30th September, reaching 225% of the original target. The album was recorded by Matt Elliss (Terrorvision, The 1975, The Black Spiders) and mastered by Pete Maher (Linkin Park, The Killers, Nine Inch Nails). The new single / video, ‘We Escaped A Cult’, was released on the 14th October 2013 and had significant airplay on UK’s Scuzz TV, and reached number 5 in the ‘Top 20 Fresh New Videos’ chart. ‘Empire of the Damned’ was released to pledgers on 30th September 2013 and was released worldwide on January 24th 2014. To Promote their latest album 2014 brought the massive “Tour Of The Damned” with dates through out the UK and mainland Europe. Playing major cities such as London, Manchester, Newcastle, Edinburgh, Copenhagen, Stockholm, Hamburg, Southampton & Birmingham as well as playing several summer festivals. Falling Red are endorsed by; Vonhatski Amplification, Vintage Guitars, Xcel drumsticks, Rock N Roll Gangstar Apparel (USA), Serial Drummer clothing.